Today, when you order "Super Soft 2 Inch Sponge Balls", you'll instantly be emailed a Penguin Magic gift certificate. You can spend it on anything you like at Penguin, just like cash. Just complete your order as normal, and within seconds you'll get an email with your gift certificate. 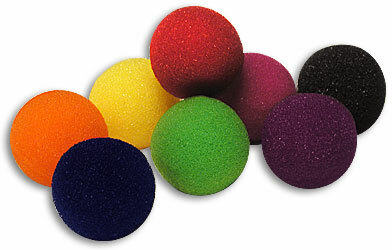 These vibrant Goshman brand sponge balls are a must for any close-up magic worker. They are the highest quality available. This is the perfect way to learn some cool sponge magic. 4 Super Soft 2inch Sponge Balls. Instructions for complete routine. From kids to elders......everybody loves sponge magic! BUY IT BUY IT BUY IT! Excuse the vulgar title. Goshman has always produced the most high quality, amazing sponge balls ever. They are obviously super soft and bouncy, as well as squishy. When they are in your assistants hands, they bounce up and really make the effect dominant that the effect REALLY HAPPENED. They don't tear easily either. I've owned sponges that tore as soon as you pulled on them and they weren't worth it. But these are super soft and really cool. Plus some of them feel a little grungy in your hands and they feel awkward. These also don't compress down in your pockets as much. These are great sponge balls and they work well in hiding from the audience, along with being able to resize quickly for the best finish possible. Worth every penny to me. High quality sponge balls, i love them. Though you might want to purchase Sponge by Jay Noblezada, or some other teaching method to really help you learn how to effectively use your sponge balls. Great quality sponge balls! Everyone needs a spongeball routine and so everyone needs spongeballs- I reckon these ares are the best ones out there. These are good value for money too! Worth getting! Sponge balls are great, no magicians routine is complete without them, endless possibilities! These sponge balls are the best you can get as well, will last a long time if taken care of. If you do not have a set of these, you are missing out. Its and awsome trick im only 13 and it was my first magic trick i ever bought from penguin and i love it. they last a long time and are a great beginer and expeirenced trick. I highley suggest this pruduct. There are endless possibilities for using the sponge balls. You can make them appear, vanish, change colors, change into other objects, and do the spongeball routine. If you're even doubting yourself just buy it because it is definitly worth the price!!! Sponge balls are a classic in magic, mulitplying balls in a spectators hand is great, priceless looks on their face. Frankly, if you're into magic, buy a set of spongeballs, you won't be sorry.